Bits are moved around the world through beams of light (fiber optics). Unfortunately the speed of light just isn’t fast enough when it comes to transferring data. It takes 134ms for light to travel once around the world. Think of all the light and bits that had to move from the Eastern United States (where this article is being served from) to you. Some of the time you spent waiting for the content to load was purely in the moving of bits over long distances. There is an obvious reason why physically moving bits closer to the consumer has massive performance benefits. It would be amazing if a web application could just live right down the street from every user of the application. But doing so would cause there to be many copies of the data, services and UI for an application. The data usually needs to be consistent across all of the users of the application. Maintaining a geo-distributed and consistent data set is a really hard thing to do without massive data synchronization overhead. The services are just the gateway to the data so they need to be near the data. But the UI, all of those static assets, can easily live in many places; ideally located near the consumers. This is exactly what a Content Delivery Network (CDN) does. Also known as “edge caching”, a CDN takes copies of static files and replicates them to servers around the world so that whenever someone downloads a static file the bits don’t have to transfer across large distances. It has often been a big hassle to geo-distibute / edge cache the static assets in web applications. The typical setups for utilizing a CDN involve complex deployment procedures and brittle architectures. But the value of edge caching the static assets is immense for any size web application. The most effective way to improve the overall performance of just about every web application is to use a CDN. 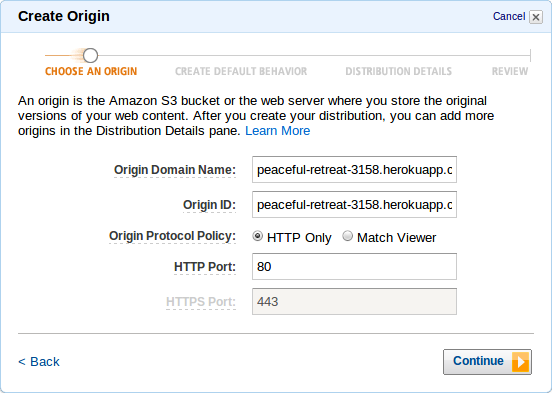 Lets walk through how you can use the Amazon CloudFront CDN, Heroku, and Play 2 to transparently edge cache static assets. Feel free to follow along. What is the application name? Which template do you want to use for this new application? OK, application play2-cloudfront is created. jamesw@T420s:~/Desktop$ play new play2-cloudfront _ _ _ __ | | __ _ _ _| | | '_ \| |/ _' | || |_| | __/|_|\____|\__ (_) |_| |__/ play! 2.0.3, http://www.playframework.org The new application will be created in /home/jamesw/Desktop/play2-cloudfront What is the application name? > play2-cloudfront Which template do you want to use for this new application? 1 - Create a simple Scala application 2 - Create a simple Java application 3 - Create an empty project > 3 OK, application play2-cloudfront is created. Have fun! "com.jquery" % "jquery" % "1.7.2-1"
resolvers += "webjars" at "http://webjars.github.com/m2"
Play has a simple static asset controller that serves files from the classpath (any Jar dependency or source directory). However, the Assets Controller doesn’t provide a mechanism in its URL resolver (Play 2’s reverse routing) to change the URL of the asset. We will need this functionality later since loading assets from CloudFront requires using a different, non-relative, domain name. To solve this we will create a new RemoteAssets controller that wraps the Assets controller and optionally adds a domain prefix in front of the resolved URLs. private val timeZoneCode = "GMT"
If an environment variable named CONTENT_URL is provided then the contenturl configuration parameter is set. This simple script simply fades in all of the images on the page when the page has loaded. This controller has a single method named index that just returns the rendered index template with a 200 HTTP status. Now GET requests to / will be handled by the controllers.Application.index method and GET requests to /assets/ will be handled by the controllers.RemoteAssets.getAsset method. Lets take this application and deploy it on the cloud with Heroku and then we will setup CloudFront to serve the static assets. Note: These instructions will not use Heroku beyond the free tier. If this is your first time using the Heroku Toolbelt then you will be led through the steps to associate an SSH key with your Heroku account. This SSH key will be used to authenticate your uploads via Git. The requests take quite a bit longer than locally, in-part because the bits have a much larger distance to travel. All of the requests except the index page (because it’s dynamic) can be served from a CDN. Now lets setup CloudFront to serve the static assets. Note: CloudFront does not have a free tier. So following these instructions will cost you a tiny bit. That indicates that the resource was served from the CDN and there was no need to go back to the origin server. And now your static assets are being edge cached! You can change that value by modifying the application.conf file (more details). Often times you will also want to use far future expires and use naming conventions to instruct the client to fetch a new version of a static asset. Grab the source for this example. Check out the live demo. UPDATE: Check out the Play 2 CloudFront Module!